Obviously Star Wars is very popular and people have dressed up like the characters a million times. I wanted to do it too but I knew I needed a different spin on it. I’ve made some backgrounds for my costumes in the past so I knew a Jabba the Hut background would be totally unique. I started by attaching 2 pieces of foam board together, cut out the shape and added arm straps. I hot glued pieces of recycled soft foam packaging material to create dimension. Then I gave it 2 coats of paper mache. I only needed 2 different colors of spray paint to create the appropriate color scheme. The eyes are craft eyes that are used for stuffed animals. I made my custom bikini at an aluminum armor making workshop. I added a braided gold cord to make it look more similar to Princess Leia’s iconic bikini. 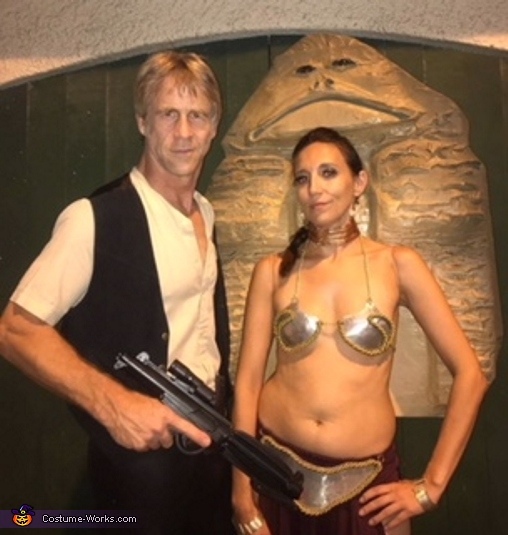 Leia needs a Han Solo so my boyfriend plucked some items from his closet to complete the look. These costumes were a hit and it was fun to run into other Star Wars characters while out celebrating Halloween!